If you think there is nothing much to be done at Wild Joker Casino just because you are in the middle of the week, you are mistaken. You can actually claim a bunch of bonuses on Tuesday, Wednesday, and Thursday. Tuesday Bonuses: You can claim 60% up to $400 on your first two deposits of Tuesday (bonus code TUESDAYW3). Wednesday Bonuses: You can claim 50% up to $300 on your first two deposits (bonus code WEDNESDAYW3). Thursday Bonuses: You can claim 75% up to $500 on your first three deposits (bonus code is THURSDAYW3). Since the above-mentioned match bonuses are all lower than 100%, they don't have any max cashout. That means that you can withdraw every single penny of the prizes you win while using them. However, the bonus amount itself is sticky and cannot be withdrawn. The online casino will remove it from your winnings. The midweek bonus offers at Wild Joker are also associated with a wagering requirement of 30x the bonus amount. This means that you will have to play through your bonus amount thirty times before you can withdraw your bonus winnings. You will find it incredibly easy to do and players have been doing it week after week. Wild Joker is one of the best online casinos for smart players who know how to make the best use of online casino bonus offers. The online casino is a paradise of bonus offers that start with a five-level welcome bonus, continue with weekly bonuses that are easy to claim and clear, and finally end with a bunch of generous weekend bonuses. New Player Bonus: You can claim a bonus of 150% up to $500 on your first five deposits. 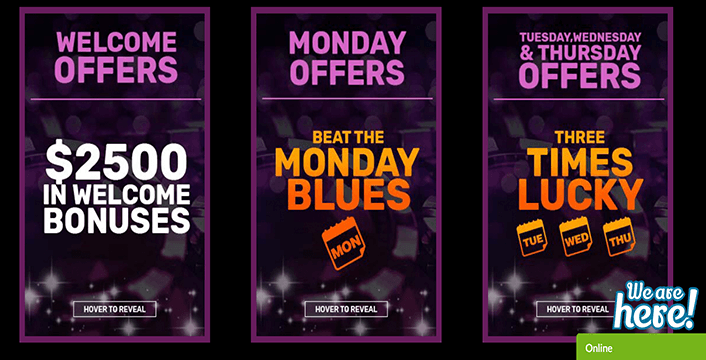 Beat the Monday Blues: Logging in to your Wild Joker account on Mondays is a great way to beat the Monday blues as the online casino offers a bunch of Monday bonuses. You can actually claim 50% up to $500 on your first (bonus code MONDAYWJ1), second (bonus code MONDAYWJ2), and third (bonus code MONDAYWJ3) deposit amounts. You can also claim 30 free spins on Coyote Cash on their third deposit amount. Just remember that you have to claim each of these offers in order. For example, you cannot claim the third bonus without claiming the first two. Three Times Lucky: These are the bunch of above-mentioned midweek bonuses that you can claim on Tuesdays, Wednesdays, and Thursdays. Friday Offers: You can claim 85% up to $400 on your first deposit (coupon code FRIDAYWJ1), 90% up to $400 on your second deposit (coupon code FRIDAYWJ2), and 95% up to $400 on your third deposit (coupon code FRIDAYWJ3). You can also claim 30 free games on Ancient Gods on your third deposit. Again, you must remember to claim all these bonuses in order. Weekend Offers: You can claim 85% up to $500 on your first two deposits of Saturday along with 30 free spins on Crystal Waters (bonus coupon code SATURDAYWJ) and 90% up to $500 on your first three deposits of Sunday (coupon code SUNDAYWJ). The best thing about all these bonus offers is that they have reasonable wagering requirements. Since all the weekly and weekend bonus offers are below 100%, you have to play through the bonus amount only thirty times to clear the bonus and withdraw your winnings. Moreover, there is no max cashout requirement. The wagering requirement for the welcome bonus, which is above 100%, is also 30x, but it carries a max cashout of 10 times your deposit amount. For example, if you win $1000 using your bonus amount and you deposited only $10, you can cashout only ten times or $100 of your bonus winnings. Wild Joker is a Curacao-licensed online casino that offers 180+ Real Time Gaming (RTG) games such as Naughty or Nice III, Asgard, God of Wealth, Cleopatra's Gold, Fucanglong, Cash Bandits 2, and Gemtopia. They are a player friendly online casino and support players 24/7 through email and live chat. The online casino offers an entertaining online gambling experience, challenging players to play for real money and earn loyalty rewards such as birthday bonuses, tier welcome bonuses, weekly cashback bonuses, personal VIP hosts, and higher withdrawal limits, among others. To enjoy all these bonuses and rewards for loyalty, all you have to do is create a real money account at Wild Joker Casino.